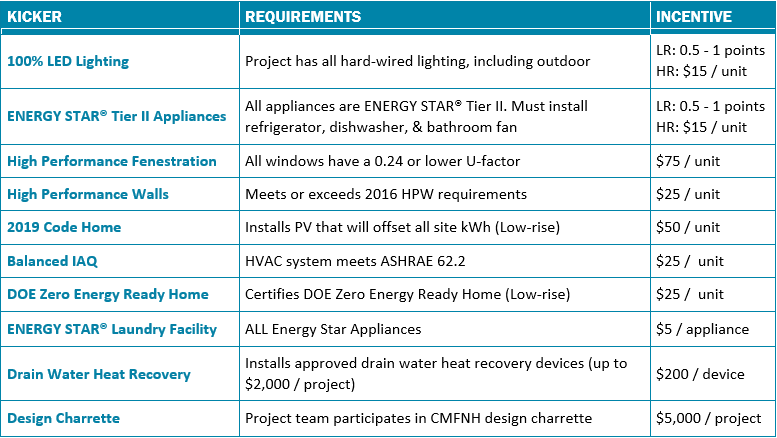 The California Multifamily New Homes program offers incentive bonuses to projects installing certain energy efficiency measures. There are two types of bonuses: point bonuses and cash bonuses. Point bonuses increase the Delta EDR for non-modelable features, add incentives for high-rise projects, and could help a low-rise project gain entry into the program. Cash bonuses are modeled features, which implicitly effect the Delta EDR for low-rise projects, and also earn the developer an additional cash bonus. One of the bonuses in the program is the drain-water heat recovery bonus option. Drain-water heat recovery captures the heat that goes down the drain with used water and helps save approximately 350 billion kWh of electricity each year in the US according to the US Department of Energy. These systems can recover heat from the hot water used in showers, bathtubs, sinks, dishwashers, and clothes washers. By preheating cold water, drain-water heat recovery systems help increase water heating capacity. This is highly beneficial in projects with undersized water heaters, and can lower the water heating temperature without affecting the capacity. Similar to irrigating lawns and plants with gray-water, heat-recovery systems capture valuable energy that is usually lost without much consideration. Savings from utilizing this previously generated energy can be significant. They are typically easy to install in new construction projects, and will increase the life of the water heater.